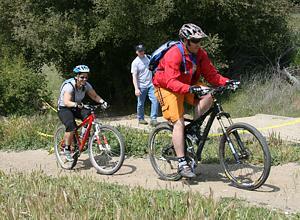 We will also have demo bikes from Trek, Cannondale, Niner Bikes, Specialized, Giant and more. Our taco bar is back with a variety of meats and veggie tacos made fresh to order! Driving time is 30 minutes from Sherman Oaks and there are camp sites available for those interested in the night before or night of. 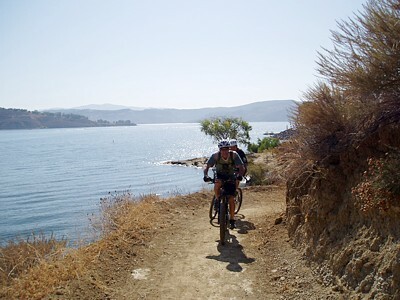 Come on out and explore the trails of Castaic Lake and support local mountain bike access and recreation. Interested in volunteering for the event? Contact volunteer@corbamtb.com. More information is available at our Fat Tire Fest page, and check out the photos from previous Fests! Brown Mtn to Inspiration Pt., Returning via Middle Merrill, Sunset, and El Prieto. The ride starts at the parking lot at the end of Arroyo/Windsor across from JPL. We will go up the Brown Mtn. fire road to the saddle then fork right down to Millard campground (water available here) then a short single track from there to the Lowe Road for a long fire road climb up to Inspiration Pt. We’ll return via the challenging Middle Merrill to Echo Mtn. then over on the Mt Lowe Railway trail to the fun twisty Sunset trail back to go up Millard Canyon fireroad then down the pretty and challenging El Prieto trail back to the cars. Ride distance is about 22 miles and expected time out 5 hours. Details at www.sbmbc.com. “The Oldest Ride in Palos Verdes.” Beginners are welcome, but terrain is steep so come prepared to do lots of climbing. Rides vary from 6 to 10 miles and from 2 to 3 hours usually. Please confirm as, although this is regularly scheduled, the leader sometimes leaves the area. Details at www.sbmbc.com. Sullivan Canyon to Woodland Hills. This ride includes great riding in Sullivan Canyon combined with ridgeline semi-technical singletrack off of dirt Mulholland. We'll Climb Sullivan Canyon and go west on Mulholland past Reseda Blvd. to Woodland Hills to play on a couple of singletrack trails. We then back-track up and ride down Sullivan Canyon (or Ridge, TBD) to complete the ride. Distance is about 21 miles and elevation gain is about 3000 feet. It is an out and back so riders can turn back at any time if they want a shorter ride. Riders from the Valley can hook-up with the group for part of the ride by meeting on Mulholland at the intersection of Reseda Blvd. between 9:15-9:30am, but you must contact the ride leader prior to the ride to coordinate. Details at www.sbmbc.com. A great ride for first timers to CORBA. One of the easiest and most beautiful rides near Los Angeles! We will ride up Sycamore Canyon and take the Two Foxes Trail. This will be an eight-mile round trip ride on fairly level ground with one stream crossing, some single track and fire road. The leader will go over the basics of how to ride a mountain bike as we enjoy following the river trail into Sycamore Canyon. If everyone agrees, we can add or subtract from the standard ride, and for example, go up Guadalasca to Overlook and back down to the start. Details at www.sbmbc.com. Saturday September 6 is the next skills clinic. OAKLAND , CA - The Northern California High School Mountain Bike Racing League (NorCal League) will launch the Southern California Interscholastic Cycling League (SoCal League) in the 2009 academic year with grant support from the Easton Sports Development Foundation II. The new league is based on the successful model of the NorCal League, now in its eighth year, which currently has reached a membership of over 400 high schoolers, 150 coaches, and 35 schools from within the region. Matt Fritzinger, Executive Director of both the NorCal and SoCal leagues, said, "We are tremendously grateful for the generosity of Mr. Easton and his foundation. The grant allows us to launch a new league, and that has been a dream of ours for several years. With the SoCal League, we'll be fostering the same values of life-long physical fitness, community, and self-confidence combined with athletic competition that has been so successful in Northern California." 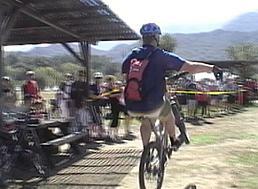 The NorCal League has developed methods and curriculum for introducing young riders to the world of mountain bike racing, as well as recruiting and training coaches that are committed to producing amateur athletes who are gracious in both victory and defeat, and are respectful of their environment and community. The SoCal League is one of the first few recipients of an ESDF II grant in part because of the proposal's emphasis on coaching, community, and making cycling a main-stream high school sport. Fritzinger said, "We know that good coaching means working closely with families, and helping athletes create a balanced life perspective. We aim to take the SoCal high school mountain bike teams in the same direction as we have in Northern California working to make cycling as important as baseball, football and soccer in the fabric of our high schools." For information about the SoCal League visit www.socaldirt.org and visit their booth at CORBA's Fat Tire Fest on October 12.